England brought their heavy artillery to the MCA Stadium in Pune but still they were outgunned. They posted 350 and then had India 63 for 4 but could not finish the job. They removed Virat Kohli, the king of the chase, but others stepped into the breach. 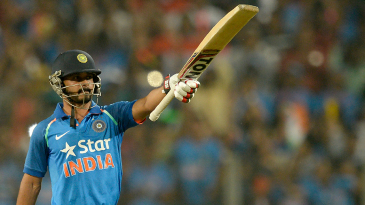 They saw off Kedar Jadhav, who scored a 65-ball hundred, but could not see off the rest. 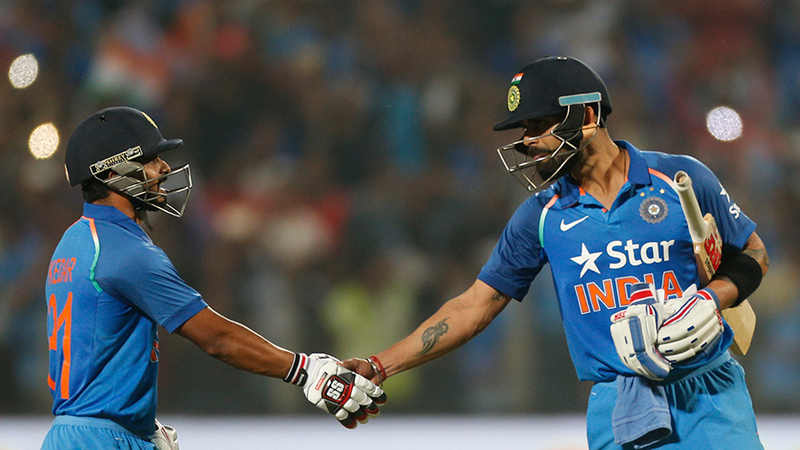 A match that aggregated more than 700 runs was finally settled in India's favour with the 23rd six of the night. This could be some series. Kohli extended the imperious form that saw him reign in all formats in 2016 to score his 27th ODI hundred and he was ably supported by Jadhav, 31 years old and playing his 13th ODI, during a partnership of exactly 200 that set up India to achieve their joint second-highest successful chase. Victory was achieved with 11 balls to spare as Hardik Pandya followed up his two wickets with a cool-headed and inventive 40 not out to guide India home.